Authentic Mexican food truck tacos offered in a permanent Hollywood Boulevard location. 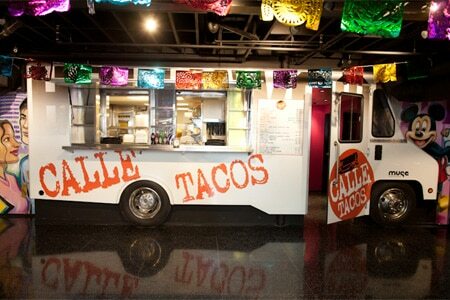 : If you want a real taco truck food experience but don’t care to chase one down, then head to Calle Tacos, a loncheria “parked” permanently inside garage doors on Hollywood Boulevard. Restaurateurs Dorian and Javier Villaseñor (Tacos Don Chente) have created a lively spot, with tourists and locals hanging out amid bright and colorful murals of Michael Jackson and Marilyn Monroe, and rocking Latin beats. Tacos are authentic, derived from Jalisco family recipes. Al pastor pork is marinated in chile and pineapple for a sweet tang, while carnitas are full of savory flavor; chicken and carne asada are also satisfying (and you can get all these in a burrito, too). Fish tacos, quesadillas and flautas round things out, and don’t miss the fresh salsas. Horchata and tamarindo soda are thirst-quenchers --- so are Corona, Dos Equis and Pacifico.